Frank Vermeulen, Dimitri Van Limbergen, Patrick Monsieur, Devi Taelman 2017. The Potenza Valley Survey (Marche, Italy). Settlement dynamics and changing material culture in an Adriatic valley between Iron Age and Late Antiquity. Academia Belgica. Studia Archaeologica 1. Fondazione Dià Cultura: Rome. Frank Veremeulen 2017. From the Mountains to the Sea. The Roman Colonisation and Urbanisation of Central Adriatic Italy. Babesch Supplement 30. Peeters: Leuven. 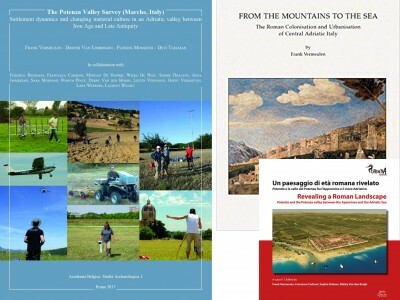 The Potenza Valley Survey, led by Frank Vermeulen, conducted archaeological investigations from 2000 to 2015 in the Marche. The project was international, multidisciplinary, and has now been synthesised in three distinct volumes. The Belgian Academy in Rome has inaugurated a new series with a major archaeological report of over 400 pages, including sites and finds catalogues (abbreviated PVS below). Frank Vermeulen has published a monograph which places the results into a wide-ranging regional and historical analysis (FMS). Finally, and accompanying an exhibition which has been shown in Rome, Porto Recanati and Ghent, Vermeulen and his collaborators have produced an attractive and helpful account for a general audience with a particular emphasis on the colony of Potentia (RRL). The project combined field survey with a number of other techniques. Three sample zones were chosen along the course of the Potenza river – towards the head of the river and in the lee of the Umbria-Marche Appennines between the Roman towns of Camerinum and Matelica; the territory of Treia in the middle valley; and the coastal area between Potenza Picena and Porto Recanati. These were extensively and intensively surveyed, with a variety of sampling techniques. The project also made use of aerial reconnaissance to great effect, and then added substantial magnetometry surveys and some targeted GPR survey. Finally the team conducted geomorphological survey (hand augering, sediment analysis, LIDAR). This intensive combination of methods has given us an infinitely better understanding of the river valley as it has changed over time. No review can give more than a sense of the richness of the new material and findings. This has been a hugely successful project, and enormous credit goes to Vermeulen and his team, and also the long term Belgian and Flemish funding necessary for such a largescale project. It is reasonable to note that this combination of methods is now frequently used, but the scale of this project is unusual and should encourage other largescale project designs. It remains to summarise what the project has contributed beyond additional data. One of the most significant findings is undoubtedly the density of occupation over time. The Marche is currently not one of Italy’s most populous areas; and it has also been a relatively understudied area. The presentation of the data including archival material offers a joined up view of the area which has not been available before, and the focus on rural settlement allows for a more complex picture of regional development. The protohistoric material from the survey gives us a more finegrained information about the local experience of an area profoundly affected by the mixture of populations; Umbrians, Etruscans, Picenes and Celts all operated in this relatively narrow band of territory facing the Adriatic. Hilltop sites are important, and Vermeulen suggests especially in PVS that augury and other religious activity may have been important here as at Umbrian Gubbio across the mountain range; this seems particularly plausible for Monte Primo. It is not surprising to find archaeologists suggesting a sacred landscape in prehistory, but it is intriguing to see the explicit connection with landscape control, with evidence from some important funerary evidence, for instance at Montarice. The size and complexity of Monte Pitino also implies economic control, and supports arguments about elite driven territorial control, such as promoted by Corinna Riva. Although clearly networked into wider distribution networks, including with the Greek world, as is visible through burial goods such as in necropoleis like Numana, the level of internal development and exploitation of resource from the late Bronze Age is important, and in FMS, Vermeulen insists that the area develops a proto-urban culture between the sixth and fourth centuries BC. The Potenza Valley is perhaps a little slow in this regard (and in comparison with the Umbrian situation), but other regional centres are more precocious (e.g. Cameriono), and the trend is comparable. This will become important for an understanding of the Roman impact but we should pause for a moment to consider what proto-urban really means in this context. To some extent, proto-urban is being used to imply architectural and structural development, such as walls, stone built houses and so forth. It is also, however, implying something about social stability. Sites which prove themselves over centuries to have effective resources for defence, economic control and symbolic capital are also themselves resources for the maintenance of structural inequalities in favour of elites over population clusters. Moreover, even if we can rarely see fluctuations in this elite but may choose to suppose this must have happened, the description proto-urban appears to suggest that the structures were sufficiently strong to survive occasional turnover in the elite. They were even strong enough to survive the so-called Celtic invasions. There was a gradual move from hilltop to river floor, which was driven by the desire to take economic advantage of trade. This is what I take from both the specifics of the Potenza Valley and the broader regional situation; that there is a relatively stable exploitation of resource, which evolves as the ecological and economic niches and networks evolve. This is a significant claim for an area which is also known to have had high levels of ethnic mixture, and makes me want to think harder about the claim that this is to be understood as a product of the combination of aristocrats and clientes (PVS p.381). In a sort of triangular relationship between landscape, elite and community, we continue too often to miss the last part of that diagram. If I am right that Vermeulen and colleagues have shown some level of relative stability up to the Roman conquest, this is then highly relevant to the Roman colonial moment, and the project as a whole is critically significant to the current rethinking of Roman colonization (see for instance T. Stek and J. Pelgrom’s important volume, Roman Republican Colonization. New Perspectives from Archaeology and Ancient History,Rome 2014). Part of the problem raised by this new research is the extent to which Roman colonization disrupted landscapes. The old model surely overstated this by casting the pre-Roman landscape as highly ineffective and disordered and the post-Roman centuriated landscape as highly effective and ordered, thus creating a completely different economic order. Yet the new settlements clearly do have a huge impact; they were urban from foundation, and territorially ambitious. The picture from the Potenza survey begins I think to nuance the position. The towns clearly are significant and there is no reason to doubt that, but the rural situation in the Potenza Valley seems relatively slow to change. In the region more generally, the suggestion seems to be that immediate hinterlands respond more quickly than less immediate hinterlands. That is not surprising, but perhaps allows us to imagine differently calibrated rates of adaptation and impact. This then becomes very important in thinking through the impact of the Hannibalic occupation, which has sometimes been thought to be significant. For Vermeulen, the greater impact seems to be in the strengthening of Roman resolve, which may have been as important for changing temporary Roman solutions as for indigenous settlements. As we continue to think through the results presented here, one of the critical questions will be the extent to which they help us understand Roman intentions in the Adriatic. The extent to which Rome was determinedly planning to exert control, signalled not only by the interventions in Illyria but also by the colonial activity, has been much debated. It might be arguable that a slow transformation of the landscape implies limited ambition, but my initial reflection is that we are seeing a clearly concerted effort, albeit limited by resources, by the magnitude of the task, and by the need to integrate local power structures to some extent. At any rate, by the time of the Social War the result is clear – a highly urbanised landscape, with a distinctive culture, which had networked the various hinterlands and developed significantly sophisticated city plans, most sharing a set of key structures, but also adapting to landscape and resource. The new city plans of towns including Potentia, Treia and the municipium Septempeda, which result from the combination of techniques described above, is a highly significant finding of the Potenza project, and the chapter on the urban settlements in FMS in particular is essential for the study of Roman urban form. Variety and vitality are clear characteristics, and the towns are highly successful; they are places of spectacle and order, symbols of Roman power, but also engines for the shaping of what Romanitas meant. One strand which could be developed further (and was begun by Tesse Stek in his important monograph Cult Places and Cultural Change in Republican Italy, Amsterdam 2009, would be the continuation of the sense of a ritual landscape from the pre-Roman times, changed but not entirely overturned by Roman interventions both in towns and in sites such as Monte Rinaldo, a site of ongoing investigation by Enrico Giorgi at the University of Bologna and the British School at Rome. Any history of municipal Italy now needs to devote attention to the phenomenon of northern Italian urbanization, and this has huge ramifications. What was the urbanization rate (the percentage of the total population living in urban areas)? What impact does this have on the debates over demography, which have often focused on the north? How different is this area from say southern Italy or Sicily? FMS concludes with this exciting picture of urban vitality, but PVS and FMS continue the story into the period of decline. This starts in the second century AD and accelerated thereafter. Inevitably this data will come to play an important part in debates over the impact of the Antonine plague. The decline of these cities is dramatic – and Potentia is a case in point. Euergetism dries up. Inwardly turned villas replace more communal expressions of symbolic capital. The city shrinks. There is a brief recovery in the fourth and fifth centuries, but by the post-imperial period, we see abandonment, and a return to a settlement pattern which is similar to that of the pre-Roman network of hilltop settlements. This makes one think again of our triangle of landscape, elite and community; the nature and role of the wider population through this catastrophe remains to be understood. Further work on the impact of climatic conditions will also be needed, especially in the wake of work such as Kyle Harper’s The Fate of Rome: Climate, Disease, and the End of an Empire (Princeton, 2017). Certainly there are hints that the soil hydrology of the valley floors were changing through this later period. This is then a beautifully conceived trilogy of books which cap 15 years of remarkably successful archaeological work. The Potenza Valley Project takes its place as a landmark work of archaeological survey. Its ambition and impeccable planning have transformed our understanding of this river valley, contributed to a much better understanding of northern Adriatic Italy, and set a number of crucial research agenda for the future, including in terms of conservation, heritage management and the broader public understanding of archaeology. The great lacuna which remains is in our understanding of the other side of the Adriatic. What were the social and economic processes there which mirrored, mapped or perhaps diverged from the transformations on the Italian side? As Croatian archaeology begins to develop (see David Davison, Vince Gaffney, Preston Miracle and Jo Sofaer [eds.] Croatia at the Crossroads: A consideration of archaeological and historical connectivity. Proceedings of conference held at Europe House, Smith Square, London, 24–25 June 2013 to mark the accession of Croatia to the European Union, Archaeopress 2016), and equally importantly as we see the emergence of new work in the southern Adriatic (Catherine Morgan’s forthcoming book on the Ionian Islands is eagerly awaited), we may begin to be able to create an even more coherent regional picture. The Adriatic is now fundamental to our understanding of the ecological and commercial narratives of the Mediterranean and an urgent area for new research.